Isn’t it good to know that the quality of CHEETAH Safety Shoes is backed by precise craftsmanship, good manufacturing practices, and over 25 years of safety shoe manufacturing experience? 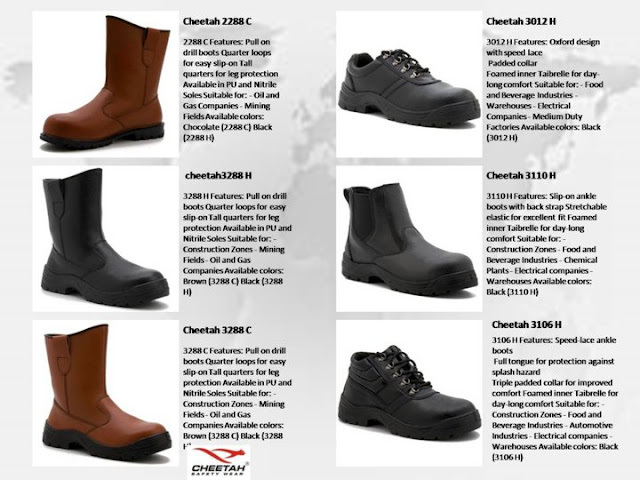 CHEETAH Safety Shoes is made to protect your feet regardless of the hazards in your working environment. In order to ensure the quality and durability of our products, we always center our production on the finest shoe-making technology available. The molded nitrile rubber sole is formed through advanced vulcanizing technology to guarantee its durability and compatibility to high-heat working environment. Nitrile rubber provides unbeatable resistance to oil, acid, and alkali hazards. This sole provides a perfect balance between toughness and flexibility. Polyurethane (PU) Sole The Polyurethane sole has become the most popular material in our safety shoe range. Polyurethane is a chemical compound that provide exceptional shock absorption and light-weight soles. Our PU soles are molded and injected directly to the shoe uppers to result in sturdier and highly comfortable shoe construction. Our steel toe-caps are made from heat-tempered carbon steel and manufactured in compliance with the European EN12568 Standards. They are made to withstand impact of 200 Joules in order to ensure maximum safety and protection. Does not break down under frequent exposure to wet, greasy, and acidic working conditions. Light-weight aluminum plate to further protect the feet from puncture hazards. Prevents accidents resulting from reactions due to electrical discharge. Effectively provides extended protection to the foot’s metatarsus area. gallery fashion and the world mining industry equipment. 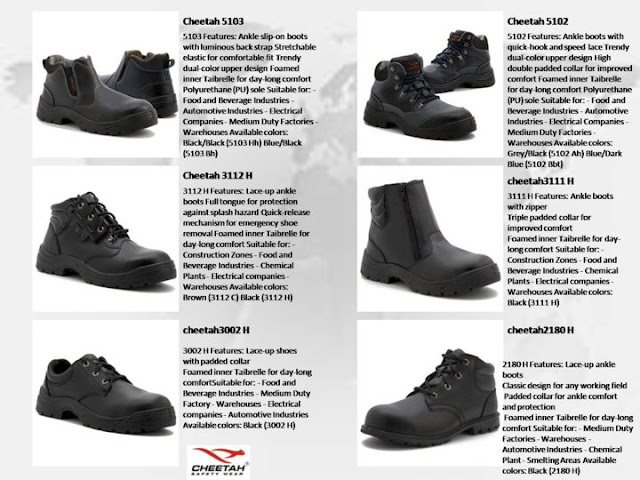 a collection of various brand shoes field worker safety, especially for field workers who deals in the world of mining and various other industrial safety equipment. berusaha tuk membahagiakan orang2 terdekat dan orang lain. kita tidak bisa menjadi bijaksana dengan kebijaksanaan orang lain,akan tetapi kita bisa berpengatauhan dengan pengetahuan orang lain. Bukti akal fikiran seseorang adalah perbuatannya, dan bukti ilmunya berada pada tutur katanya..
dan jangan sesekali mengucapkan selamat tinggal ,jika kamu masih mau tuk mencoba..,dan jangan sesekali menyerah jika kamu masih merasa sanggup, dan jangan sesekali kamu mengatakan tak mencintainya lg, jika kamu tak bisa tuk melupakannya.. THE ARTISTIC'S gallery safety shoes and safety equipment, a collection of various brand shoes field worker safety, especially for field workers who deals in the world of mining and various other industrial safety equipment. Tema Jendela Gambar. Gambar tema oleh mariusFM77. Diberdayakan oleh Blogger.